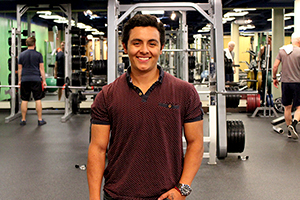 Christian Castaneda, fitness director at ONE Boulder Fitness, works and lives in the heart of downtown (lucky him!). Christian is a true Boulder local having attended school in Boulder Valley School District since elementary school and graduating from Fairview High School and then Adams State University. He's a sponsored athlete (Colorado Nutrition), an award winning fitness trainer (2016 trainer of the year) and the youngest fitness director in the Boulder area. Christian embodies the "work hard, play hard" lifestyle! After that I usually head to Amana Yoga Studio to ground myself with Alia Sabben to make sure I stay healthy and flexible for competitions throughout the year. As one of the youngest entrepreneurs in the downtown area it's important for me to look my best so I usually head over to Truman Barber Co. for a clean cut. Ask for Asher, Ryan, Cole or Justin - they are the best! I spend the majority of my day touring guests around ONE Boulder Fitness and showing them the "hidden gem" aka the spa room with a hot tub, steam room & sauna. OBF has been locally owned for over 13+ years and is still the only fitness facility of it's kind in the downtown area! I enjoy my emails and happy hour with great views and drinks at Corrida's outdoor patio. Trust me, the scene up there can't be beat! My late nights usually consist of stomping around the dance floor at Tahona Tequila Bistro and ending my date nights with desert at Sarah Amarose's shop Piece, Love & Chocolate on West Pearl on my way home. I love the Downtown area for the incredible people I get to meet and the energy people bring from locals to visitors from around the world! I love Downtown Boulder, it's just home! Sophisticated, Spanish-inspired steak restaurant with cocktail menu and a wine list to match, plus a rooftop patio with a magnificent, unobstructed view of Boulder's iconic Flatirons.